Day 3: morning – bake! (1) Mix the flour, salt, sugar, starter and 200ml of the water together in a large bowl and mix to form a fairly firm dough: don’t worry if it feels on the stiff side at this stage, but add a little more water if necessary. Knead lightly for about a minute, before adding the butter, a bit at a time, and kneading this into the dough for about a minute or until the butter has been completely incorporated. The dough will be smoother and slightly softer at this stage. (2) Cover the dough and leave a room temperature for about 4-5 hours to start to ferment. Put the bowl in the fridge for about 12 hours or overnight. Don’t worry if it hasn’t risen much at this stage, as the starter will still be working gently and very slowly behind the scenes, already developing flavour. (3) Shape or bash the butter into a square about 20cm by 20cm and chill until needed. You need the butter to be cool but slightly soft and malleable rather than too firm or brittle, so remove it from the fridge about 30 minutes or so, before you want to laminate the dough. 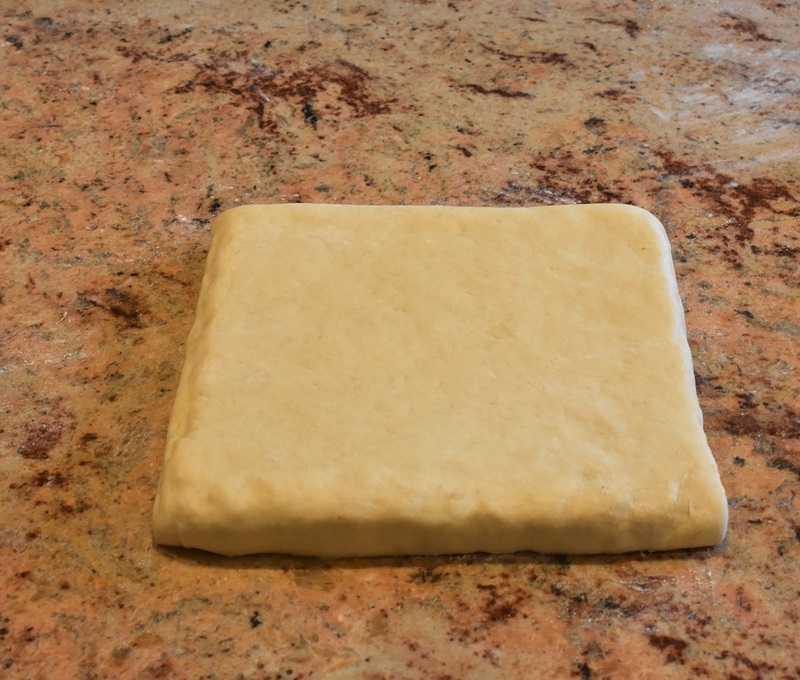 (4) Roll out the chilled dough to a rectangle that is just over 40cm by 20cm, with the shortest edge facing you. 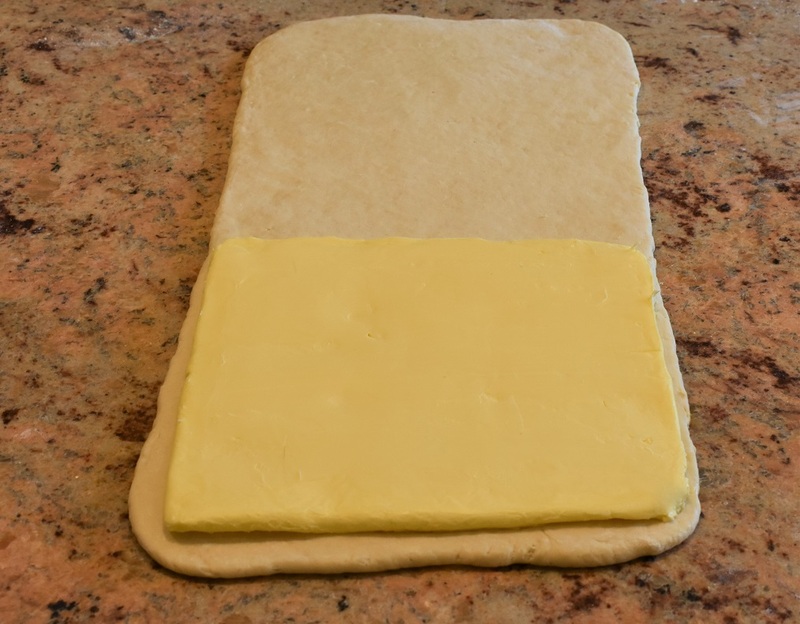 (5) Place the butter in the centre of the dough and bring the top and bottom flaps over the butter, sealing gently along the two side edges and top, trying not to trap air bubbles. Brush off the excess flour. 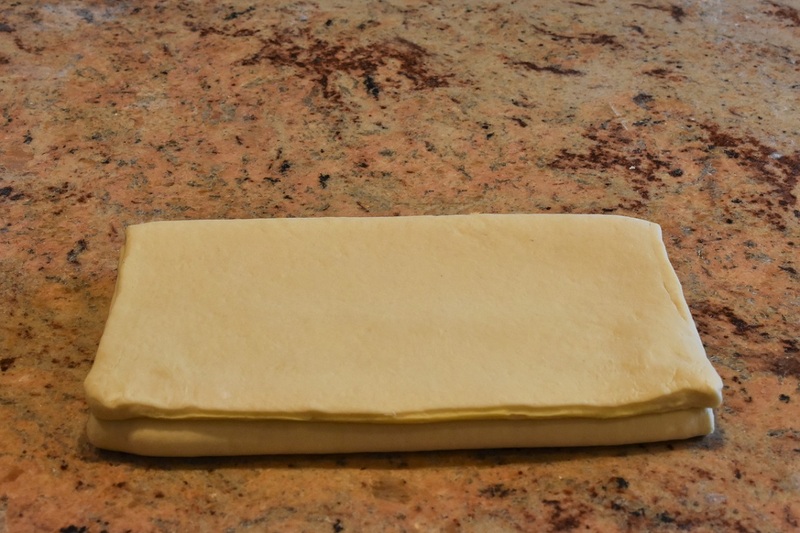 (6) Roll out the dough to a long, thin rectangle – about 20cm by 75-80cm. Fold the bottom third of the dough up and then bring the top third of the dough over this, still keeping the edges as straight as possible: as in the photos below. This is one turn (an envelope turn). (7) Cover the dough with cling film and put in the fridge for about an hour to rest and chill down. 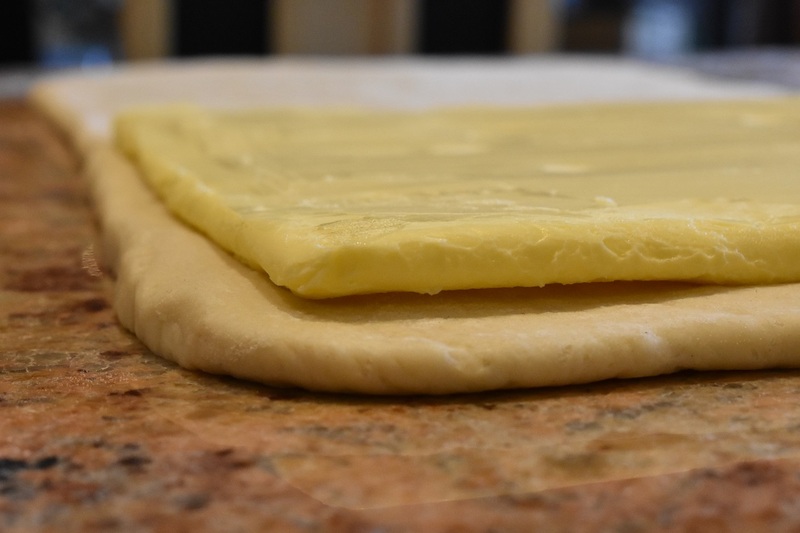 (8) Rotate the dough 90° (as in the photo below) and give two more turns, rolling out each time to about 20cm wide, 60cm-70cm long and no more than 5mm thickness, making sure you rest the dough in the fridge for about an hour each time. You have now done the three turns. Refrigerate the dough for at least two hours before shaping: the longer you chill it, the easier it will be to roll out the dough for shaping with the minimal pressure that is needed. 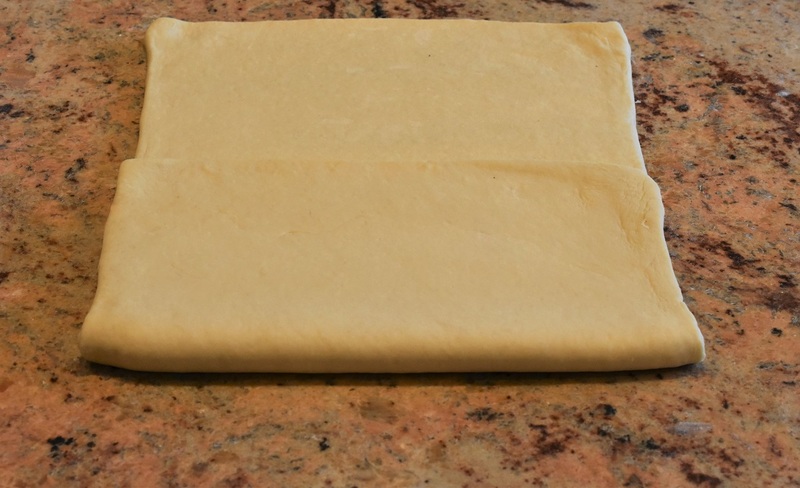 (9) Remove the dough from the fridge and leave on the work top for 5 minutes or so to allow the butter to just start to soften up, making it easier to roll. 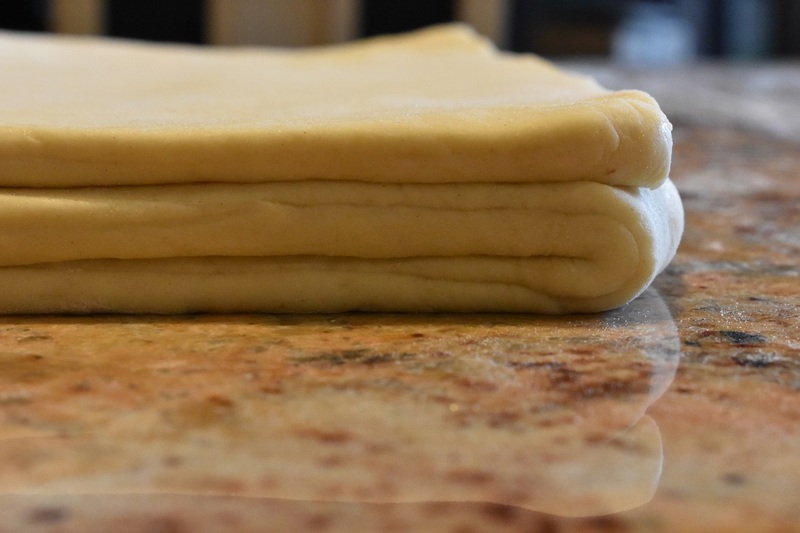 Place the dough with the closed edge away from you, so the edges nearest to you and on the left and the right show the 3 layers of dough. NB: this is the same way round the dough was when you finished the last turn, without rotating it at all. Seriosuly, it is so much easier having it this way round at this stage. 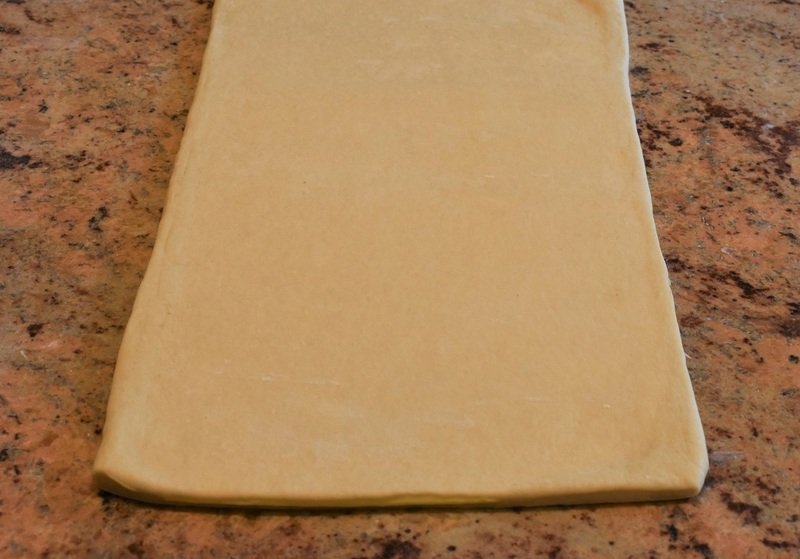 (10) Roll out the dough until the rectangle is about 25cm long. Now rotate the dough 90° so the closed edge is on the left. Roll out to a long rectangle about 4mm thick and leave the dough for a minute or so to relax before cutting (otherwise the dough might shrink on you). Trim the edges with a sharp knife and cut into triangles with base 12cm and height 24cm. (11) Take a triangle and use cool hands to stretch it out a little. Repeat for the other triangles. (12) Make a cut in the centre of each base, going about 1cm inwards, and gently pull apart the dough either side of the cut to widen the base a little. Roll up fairly tightly at first, easing up as you reach the tips. (13) Brush the tops lightly with the egg wash and pop the shaped dough onto baking sheets lined with baking parchment or silicon mats and place inside a large plastic bag or bin liner, making sure the plastic is not touching the dough – a tall cup or tin in there helps keep the plastic off the dough. Leave at room temperature for about 6-12 hours, depending on the room temperature, to rise significantly, before transferring to the fridge overnight, where they will develop a great depth of flavour. If the room is cool, leave them out of the fridge overnight. (14) The following day – finally baking day! – take the shaped and risen dough out of the fridge and leave at room temperature for about an hour. Meanwhile, preheat the oven to 220C (fan): slightly higher than for croissants using commerical yeast. (15) Brush the dough with egg wash and pop in the oven, immediately turning the temperature down to 180C (fan). Bake for 25-30 minutes until deep golden brown and they feel light when you lift one: a bit longer than for croissants made using commerical yeast.